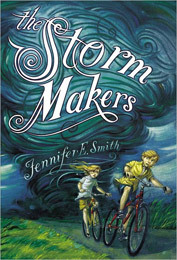 Jennifer E. Smith’s The Storm Makers is a thrilling new adventure story. This novel began on an ordinary summer day, when, unusually,twins Ruby and Simon saw tornado warnings coming in every minute. Outside there were sudden gusts of wind and rainstorms. Simon’s emotions seemed almost connected to the weather. For example, he got a fever and not even a moment later a tornado occurred. Later on in the novel,the family found out that Simon was a storm maker. All the characters in The Storm Makers have unique personalities. Simon has an odd personality partly because he has the ability to control the weather or start a storm. Ruby has a trustworthy personality. When she found out that Simon was a storm maker, he wanted her to keep it a secret, and that is exactly what Ruby did. The author makes the characters seem real by explaining their emotions and feelings. The author also describes their everyday lives and routines. Also, the characters are likeable because they live their lives like kids do now. In addition, they take on adventures such as researching how the storm maker’s came to be what they are. In the book Simon says, “ I had the weirdest dream last night, there was this guy in my room at the hospital.” This quote makes me feel that the book is interesting because it explains the ups and downs of the challenges the kids face. I would recommend this book to kids and parents because it is a story about people working together, to accomplish a great goal. In this story, Ruby and Simon have the task of trying to save the world from a rogue storm that is created by a Storm Maker, who has a deadly plan. The book The Storm Makers is a great new action packed novel that I enjoyed reading.